Letter No. DD (M)/Solar Panel/2019 dated Lahore the February. 2019 regarding Installation of Free Solar Panels in School Education Department Punjab by a government of the Punjab school education department (monitoring wing). All the Chief Executive Officers District Education Authorities (DEAs) Punjab. 2. 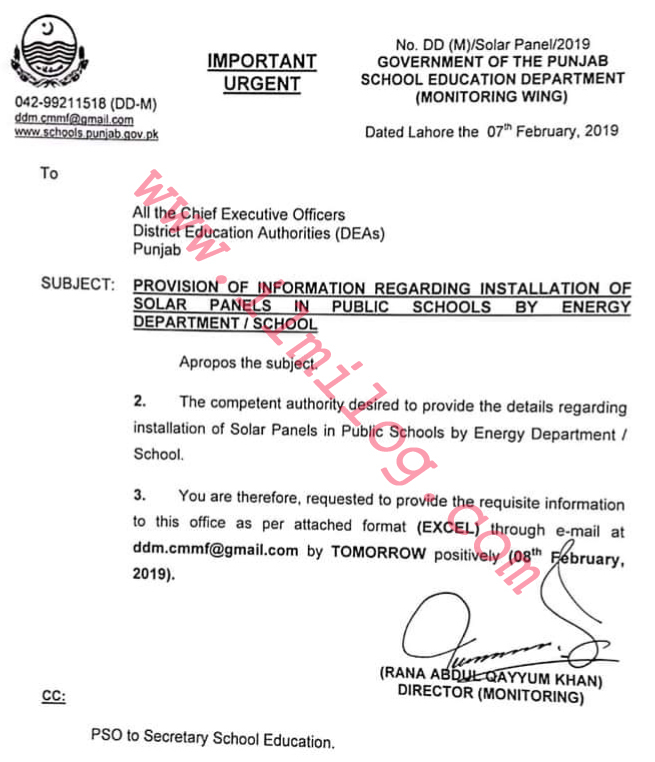 The competent authority desired to provide the details regarding the installation of Solar Panels in Public Schools by Energy Department / School. 3. You are, therefore, requested to provide the requisite information to this office as per attached format (EXCEL) through e-mail at ddm.cmmf@gmail.com by TOMORROW positively (08th February 2019). PSO to Secretary School Education.